Karl Elder, an accomplished author and poet, has been with Lakeland since 1979. 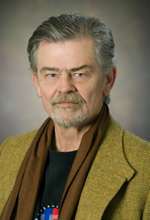 He earned his Master of Fine Arts in creative writing from Wichita State University and his master's in education from Northern Illinois University in 1974. He received his bachelor's in education from Northern Illinois. Elder has 10 published books to his name, more than 22 anthologies and about 500 published poems in various magazines. He has won more than a dozen awards, including most recently the Christopher Latham Scholes Award from the Council of Wisconsin Writers in 2012.